First and foremost, thank you to our Board and membership for the opportunity to serve as president of this wonderful organization. It is an honor to lead LWVMD in this very important time. As a first-time League president continuing in the footsteps of Emeritus President Susan Windmiller, I know we face daunting challenges. However, I have the utmost confidence in our members to help me guide the organization as we work to make a positive difference in all sectors of our community. I urge you to volunteer and become involved in any capacity you possibly can. We all have talents that can help make our program a success! Thanks to all who attended our Annual Meeting on June 16. Alberto Carvalho, dynamic Superintendent of the Miami-Dade County Public Schools, reminded us of the values this country is built on and of the need to focus on our children and their future. Honorable Chief Judge Bertila Soto inducted our new board. We also honored our Community Partners, The Center for Social Change and The CLEO Institute, and Board Member Madison Berndt for her dynamic leadership. Members approved our new Slate of Officers and Directors, our 2018-2019 Program Priorities, and the FY 2018-2019 Budget. 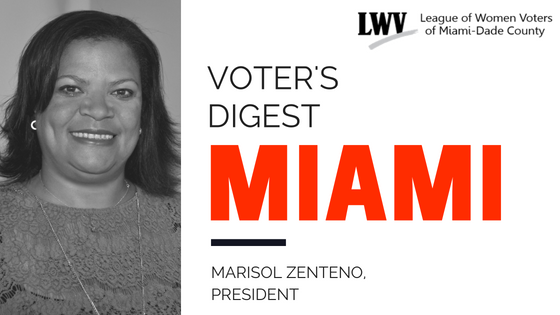 For more information, please email us at info@lwvmiamidade.org. 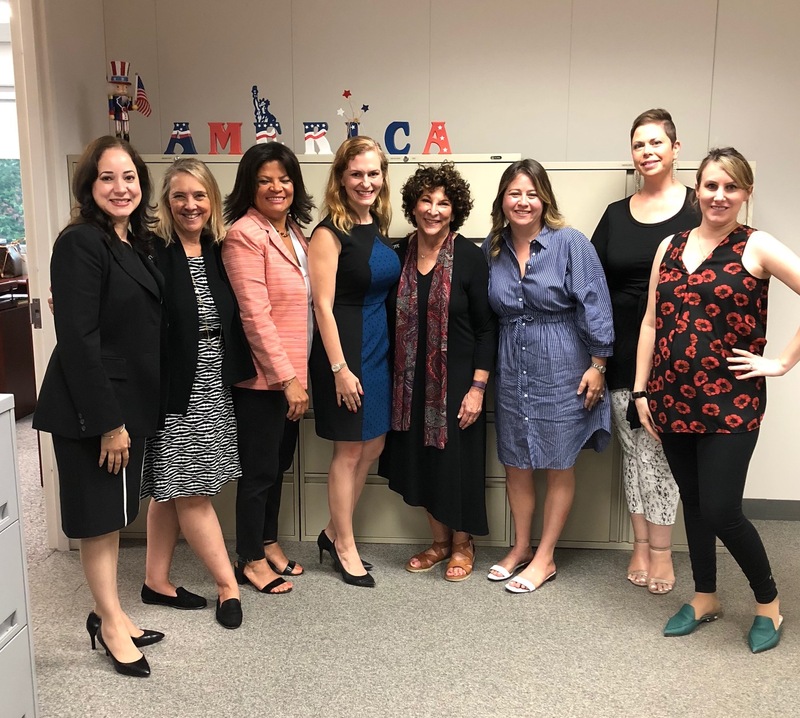 On June 27, LWVMD Executive Board members met with Miami-Dade Supervisor of Elections Christina White and her senior staff to discuss preparedness for the upcoming primaries and general election. We identified ways to improve our own voter registration efforts as well as what to do if a voter has difficulties in registering, doesn't receive their voter cards in a timely manner, or encounters issues on election day. We also discussed ways to inform the electorate that ALL registered voters will have candidates and issues to vote on during the August 28 primary. 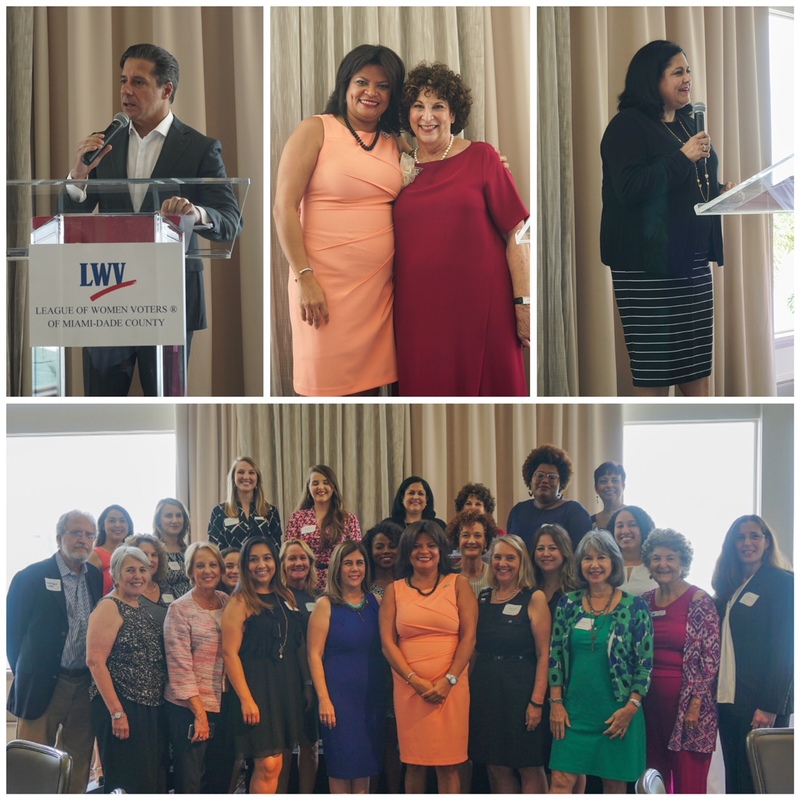 This fruitful meeting showcased LWVMD's vital role in advancing and protecting democracy in South Florida! VOLUNTEERS NEEDED FOR GOTV AND VOTER REGISTRATION! As Election Day approaches, we are receiving many requests for help with election preparedness and Get Out the Vote events. If you would like to be added to our monthly mailing list of volunteer opportunities, please email volunteerslwvmd@gmail.com. Details on listed events will be provided as dates draw near. Feel free to send any ideas or comments regarding volunteer issues to volunteerslwvmd@gmail.com. We are always looking for new ways to improve our voter services! 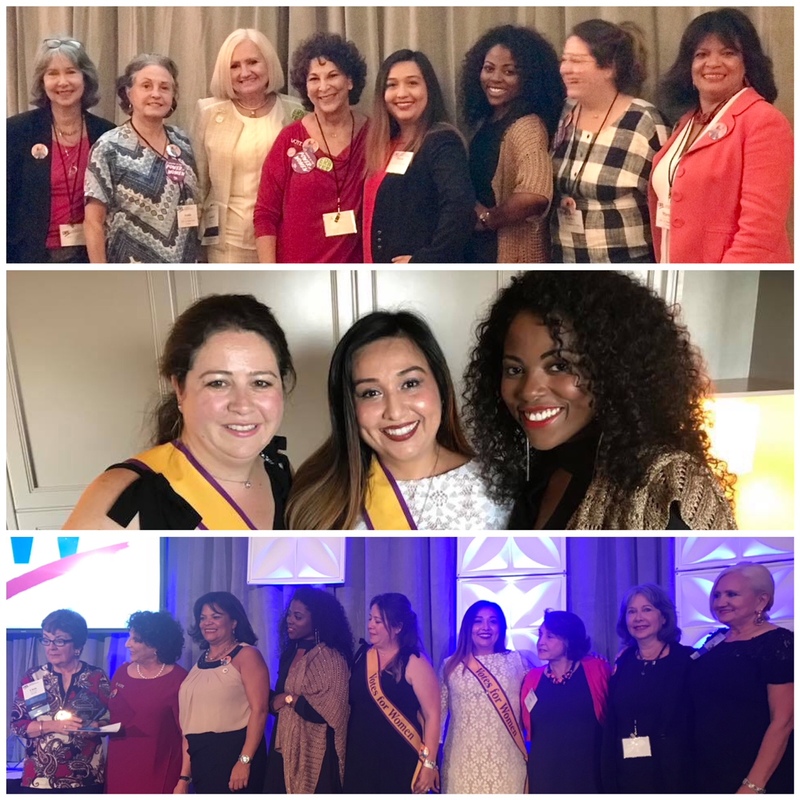 Eight LWVMD delegates joined League members from across the country in Chicago June 28 – July 1 for the biannual LWVUS National Convention. The packed schedule included discussions and votes on the 2018 – 2020 budget, slate of officers, policy positions and priorities, and proposed amendments; advocacy and inclusion trainings; breakout sessions on topics ranging from fundraising to engaging youthful voters; and informative presentations by expert guest speakers on important issues like redistricting and gerrymandering. Incoming LWVUS CEO Virginia Kase shared her personal story and inspiring vision for the League. Rosie Rios, 43rd Treasurer of the United States, spoke about her efforts to recognize outstanding women in the nation’s currency. Banquet keynoter was Elaine Weiss, author of The Woman’s Hour: The Great Fight to Win the Vote. And we are thrilled to announce that LWVMD’s innovative Lady Liberty-themed Give Miami Day campaign won a 2018 Convention Award for Effective Member Engagement. LWVUS Program Amendments passed at the convention focused on the League’s support of carbon emission pricing to address climate change, gun safety legislation, the passage of the Equal Rights Amendment, and the National Popular Vote Interstate Compact. For a full recap, click here. Save the date for the next LWVUS Convention in Washington, DC, June 25 - 28, 2020! I look forward to starting this new chapter for LWVMD. This is an incredibly exciting year not only for Miami-Dade but for our state and nation, one that will shape our government for decades to come. Thank you for all you do to help empower voters and defend democracy! Members are always welcome to attend our Board meetings. Bring fresh ideas and learn about ways to get involved! Live anywhere in Miami-Dade County and want to go solar? Now's your chance! Join LWVMD and our partners at AQUA as we discuss the recent Supreme Court ruling of the "cake" case, learn more about voting for judges, and review the upcoming Florida ballot amendments. Voter registration too! The deadline to register is 29 days before an upcoming election! Location: Check your voter status or register to vote here.